For the most part, travel is about having fun- exploring beautiful places, enjoying new foods and meeting new people. But travel can, and sometimes should be, so much more than that. Our visit to the Dachau Concentration Camp Memorial was one of those times. We knew it was not going to be a fun day. We knew we’d be coming face to face with one of the darkest times in human history. We were prepared for it to be uncomfortable- and it was. Still, we felt it was important to visit to the memorial site to pay our respects to those who lost their lives and suffered such brutality. As uncomfortable and sombre as it was, it was a meaningful experience to tour Dachau Concentration Camp. I think by learning about and remembering mistakes of the past, we are better equipped to not let history repeat itself. Dachau was a horrific place. For 12 years, thousands of people were tortured, abused, stripped of their dignity and murdered. It was the original concentration camp established by the Nazis, just weeks after Adolf Hitler was appointed Reich Chancellor in 1933. As the first of a vast network of Nazi concentration camps, Dachau would set the example and be a training ground for terror. Dachau was not known as a “death camp” but rather a work camp, even though over 40,000 people died there. The victims came from over 30 nations and represented people from all walks of life- German dissidents, homosexuals, Jews, Sinti and Roma “gypsy” peoples, Polish civilians, outspoken clergymen, Jehovah’s Witnesses, “anti-socials” and others who did not “fit in”. Overall, more than 200,000 people were imprisoned at Dachau. The brutality at Dachau continued until the end of the Second World War. On April 29, 1945, American troops arrived in Dachau and liberated the survivors, most of who were shockingly emaciated and suffering from disease. Arriving at Dachau, we entered through the same rusty gate that thousands of prisoners passed through all those years ago. 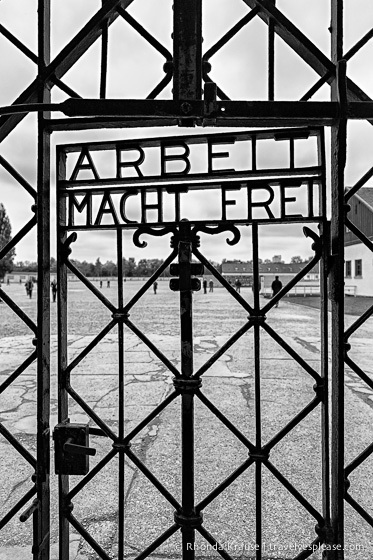 The top of the gate read “Arbeit Macht Frei”, or “Freedom Through Work”. I’m sure this made people believe that if they worked hard enough they would be released. In actuality, they were literally worked to death. The first building we saw on our tour of Dachau was the former maintenance building. Inside is a permanent exhibition about the history of the Dachau concentration camp. The exhibit is quite in-depth and there was no way we could read everything, but it still gave us insight to what went on at Dachau. From the exhibit we went to the theatre, where we watched a video that showed just how horrific conditions at the camp were. Most of the footage is from when the Americans arrived at Dachau to free the survivors. I won’t get into what we saw other than to say it was quite shocking, graphic and hard to watch at times. After the video, we toured the jail bunker. For some reason, I felt the most uncomfortable here. It gave me such a bad feeling inside my stomach that I just walked down the long hall and quickly exited the building. Afterwards, we made our way back to the front of the maintenance building to pay our respects at the International Memorial. The monument was designed by Nandor Glid, a Yugoslavian artist and concentration camp survivor. His sculpture conveys fence posts, barbed wire and human skeletons. The human figures depict those who, in acts of desperation, jumped into the barbed wire fence to end their suffering. The instant someone ran towards the fence they were shot by the SS guards. Just past the sculpture by Nandor Glid, there’s another monument. The relief consists of different coloured triangles attached by a chain, representing the triangle badges that identified every prisoner from 1937 on. I found it interesting, and disappointing, that the relief does not show the badges of all categories of victims. Missing from the monument is the black triangle that marked the “asocials”, the green triangle of the “criminal prisoners”, and the pink triangle that identified the homosexual prisoners. The monument only recognizes those groups who were persecuted for political, racial, or religious reasons. At the end of the monument is an urn with the ashes of the unknown concentration camp prisoner. Behind it are the words “Never Again” written in Yiddish, French, English, German and Russian. Next we walked through Roll-call Square. Prisoners had to gather here every morning and night to be counted and receive their work details. This was also where punishments were carried out by the SS for all to see. I took this photo from a sign showing the prisoners lined up for roll call. From the square, we walked past the area where the barracks used to be. The first two barracks have been reconstructed, only the foundations remain of the rest. At the far end of the camp we visited the gas chamber (which was never actually used at Dachau) and the two crematorium buildings. It was unnerving to see the ovens that were used to burn the bodies and know they were not enough to keep up with the rate at which people were dying from sickness, disease or murder. After seeing the crematorium, we took some time to walk around the garden and gather our thoughts. There are a lot of different memorials surrounding the crematorium area paying tribute to the “Unknown Concentration Camp Prisoner”. Our time in Dachau was not a fun visit by any means, but an important one that everyone who comes to Munich should make. Dachau today is a place to learn about our history, while paying respect to the innocent people who suffered and lost their lives. Location: The Dachau Concentration Camp Memorial is located in the town of Dachau, about 16 km northwest of Munich in the state of Bavaria. Opening Hours: The Dachau memorial site is open daily from 9:00 am to 5:00 pm. Admission: The site is free to visit. There is a small charge for audio guides and guided tours. You can purchase tickets for a guided tour at the information desk in the Visitor Centre. Space is limited to 30 people and it’s not possible to make a reservation, so try and purchase your tickets at least 15 minutes in advance. English tours take place daily at 11:00 am and 1:00 pm as well as 12:15 pm on the weekends (July to September). It’s recommended to dedicate 2.5 hours to tour the complete memorial site. Documentary Film: The documentary film is 22 minutes long and shown in German, English, Italian and French. English showings are at 10:00 am, 11:30 am, 12:30 pm, 2:00 pm, and 3:00 pm. The film has an age restriction of 12 years and older. Getting to Dachau from Munich: Dachau is a 25-minute train ride from Munich’s Central Station (Hauptbahnhof). Take the S2 train in the direction of Dachau/Petershausen. At the Dachau station, catch bus 726 towards “Saubachsiedlung”. This will take you to the entrance of the memorial site “KZ-Gedenkstätte”. Guided Tours From Munich: If you prefer a tour with transportation from Munich and back, here is a highly rated Dachau Memorial Site Half-Day Tour you can book online. Information was correct at the time of publishing, but can change without notice. Please confirm directly with service providers. Purchases made through the included links earn us a small commission, at no extra cost to you, and help support this website. Thank you!